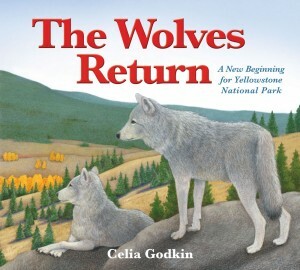 “…The wolves return by Celia Godkin, biologist and associate professor at the University of Toronto as well as award-winning author and illustrator, explains the journey of reintroducing wild wolves to Yellowstone and the consecutive changes in the environments of the park in kid-friendly words…. Ecology is a complex topic, but Celia Godkin does a great job with explaining biological correlations to children from preschool to middle school age. Her texts are easy to understand, without complicated technical terms or terminology. What wakes the love for nature are her artwork: True-to-life pencil and watercolor illustrations capture the attention of children and adults from the first page on. It’s hard for an expert to explain scientific topics in easy words and almost impossible to find the right words suitable and plausible for children. Celia Godkin does an expert job! The appendix of the book gives a short overview of the history of wolves in the US and is a great add on for older children, teacher and parents. Our daughter loved The wolves return. She is interested in nature in general and loves wolves…It was really enjoyable to teach her about one of her favorite animals and the development of an ecosystem within a short time span….I can just guess what a great resource this book is for homeschooling parents or teachers! The publisher also provides a teaching guide, which was unfortunately not online yet at time of this review. “…What did you like about the book? This book illustrates the effect that the reintroduction of wolves to Yellowstone National Park has had on the ecosystem. The book demonstrates that predators at the top of the food chain have a profound impact.…The illustrations of the wildlife are beautifully rendered in lush colors. The book contains more information on “The Wolf in North America,” including a map, at the back. The end pages are filled with illustrations and the names of the plants and animals that are mentioned in the book. This is a great introduction for younger children to the impacts of animals on our world. “Did you know an elephant’s trunk has more than 60,000 muscles? This is just one of many things I learned from this fantastic book. 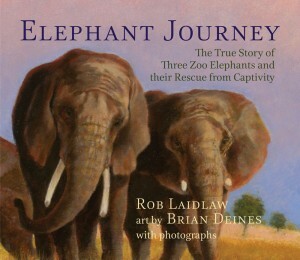 Elephant Journey: The True Story of Three Zoo Elephants and their Rescue from Captivity by Rob Laidlaw is a great non-fiction picture book. That means it is a great book with true facts, but it reads like a story. I give Elephant Journey 4.5 out of 5 Stars; to be honest that is a pretty impressive score from me. 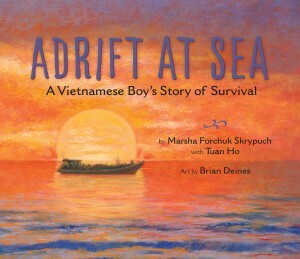 This book earned the high rating for its great illustrated pictures, shown above, and photographs, shown below, just before the index giving a more non-fiction layout kind of feel. I actually really like the design of the book. I appreciate how the author and illustrator distinguished between the story and the nitty gritty details. The illustrated pictures tell the story of Toka, Thika, and Iringa, the three elephants and their journey out of captivity. The illustrations are beautiful. The real photograph section goes more in depth into how the elephants made the journey, how the elephants thrived after (there was a super sad part), fascinating facts about elephants, and why captivity is so hard on elephants. Elephant Journey is a great book, and I see a lot of value in it…. [F]rom a reading level, interest level, and collection point of view I think this book is best suited for 4th- 6th grade (boys and girls alike), but older students could benefit with reading it and writing persuasive papers around the topic of elephants in captivity…. All in all, it was a powerful, educational, and enjoyable book to read…. Laidlaw, an animal protection activist, tells the story in this fascinating picture book. It took enormous effort, careful planning, the construction of special crates, a flotilla of semi trucks, and a summit of animal experts. The long journey was packed with tension. Illustrator Brian Deines based his lovely oil paintings on photographs of the elephants’ journey and new life in California. They provide a dynamic sense of being on the journey. I freely admit to having tears in my eyes when I l encountered scenes of the elephants enjoying their new, wide-open home.